This cake is both ridiculous quick to make, inexpensive ingredients and tastes amazing! What more could you ask for? I do not know … Perfect to give away as a gift. Mix all ingredients except almonds and berries. When you get a smooth batter, stir you in the berries. Turn into a greased and floured mold. Sprinkle with almonds. Bake at 200 C for about 30 minutes. Next Post Spagetti Bolognese – Best spagetti ever? This looks quite tasty. 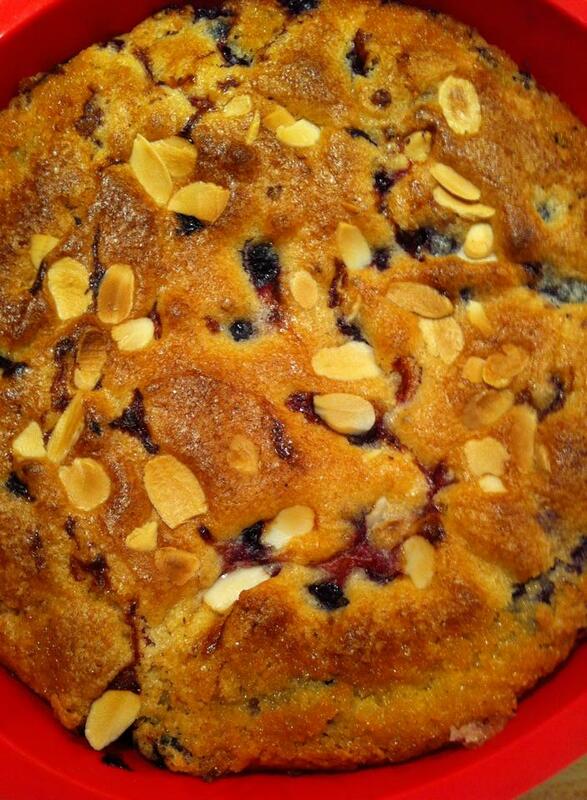 I love a simple cake with fruit and almonds. Then this cake is for you 🙂 Instead of berries, take apples or pears 🙂 And it doesnt take more then max 5 minutes to make. Wow! That is one great looking cake — and so esy to make, too! Thank you for sharing. So many of my favourite things and so easy too! Why not olive oil, and what, instead? I don’t think I have any other oil except coconut–would that work if I warm it? Thanks 🙂 My experience is that the olive oil leaves a tast into the cake that isnt what I like. Coconut I think will work fantastic and give you a bit of a coconut tast into the cake. 🙂 I normally useing corn or sunflower oil. Dinner Bank is another Food Blog I follow. They are having a contest to reblog a recipe of theirs that I like. I like this recipe! Although I have not tested it myself, I like that it is quick, moist, and contains all natural ingredients, I think I will have to give this recipe a try! Cheers, Dinner Bank!